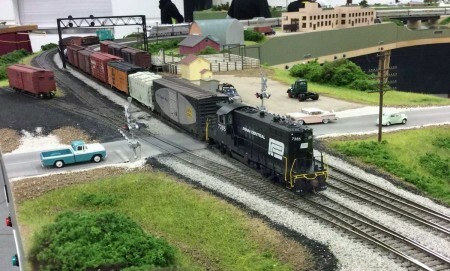 A local Penn Central freight halts traffic as it crosses Willow Springs Road. The Geep belongs to Matt Kosic. Photo by Bob Kosic. 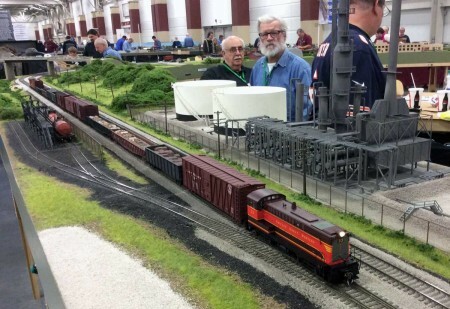 Vendors from many different fields were present, including Accrail, Soundtraxx, Scenic Express, and many others. Hundreds of model kits were available for purchase. CB&Q GP20’s head an eastbound road freight out of West Yard and past Ruby St. Tower. 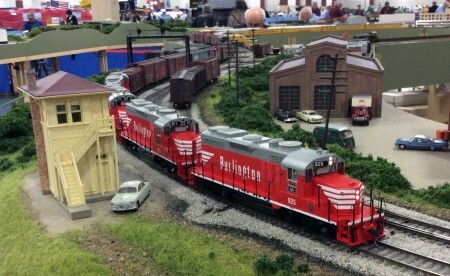 Motors are by Paul Schulz with the freight in tow by Rob Manley. Photo by Bob Kosic. One amazing note was on security. The show managers had large diagrams at the main table showing exactly where every display was to be located. Plenty of room was available for aisles and walkways, and between the layouts and vendors. Display personnel were given badges, and managers and monitors were very helpful in providing whatever was needed. Unloading and set-up were done on Friday, and everything was completely set-up by about 6 p.m. All of the displays were left overnight exactly as they were set, and as far as I know, nothing was touched. On Saturday and Sunday mornings, everything was exactly the same as it had been the night before. That proves that the show managers did things right. The CZ’s Solarium Vista-Dome observation ducks beneath the Route 83 overpass. The train is by Jim Miller. Photo by Bob Kosic. There were layouts of every scale and size, from Z to 1.5 inch, which children and adults could ride. Those locomotives weigh upwards of 600 lbs each, and there were about 10 of them. The track was so busy that crossing guards were stationed at the pedestrian crossing to ensure people were out of the way when the train came by. All layouts were operating, and some with quite a wide variety of scenes. One interesting combination was a desert mesa section next to a heart-of-the-city downtown neon display with flashing lights and signs. Adjacent to that was a heavily forested scene from West Virginia. There was quite a variety. The Mod-U-Trak HO Scale layout won Best-in-Show-Layout, and it was exceptional. 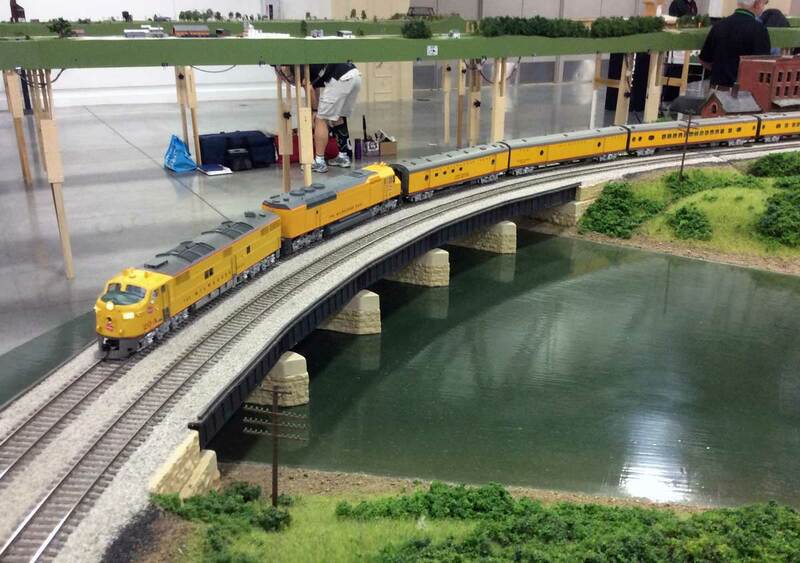 Sharing a large space in the Trainfest convention hall along with its equally superb N-scale counterpart “Modutrak” layout, a previous Best of Show winner in 2012, this was the layout’s first appearance at Trainfest. It also marked the HO Mod-U-Trak gang’s return after a 20-year absence. Here’s a link to a PDF file of the Train Fest Mod-U-Trak plan. A number of the layout’s modules represent actual Santa Fe Railway locations immediately west of the Chicago are and include areas such as Willow Springs, Romeoville, and the Des Plaines River bridge in Lemont. 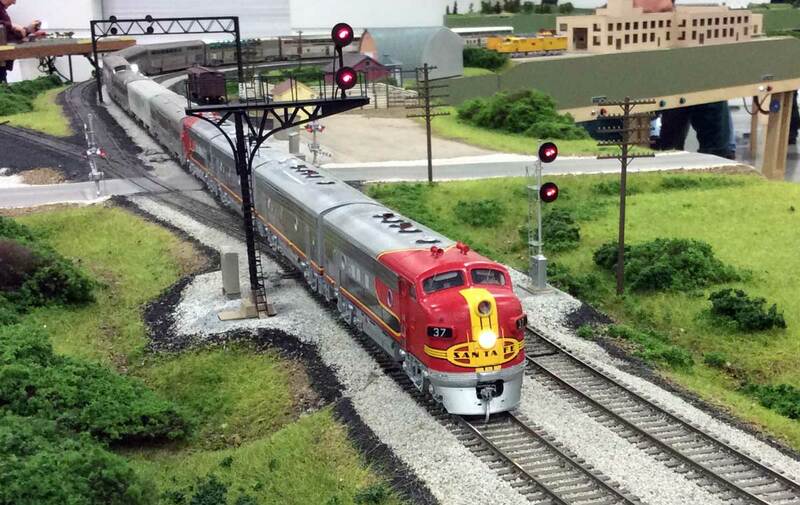 Specific scenic materials are utilized throughout the layout to maintain a uniform scenic appearance with various static grasses and Scenic Express turfs predominating. The California Zephyr approaches the Route 83 overpass. Photo by Bob Kosic. Uniform finish and construction carried over to the modules. These were built from varnished cabinet-grade Baltic Birch plywood and Poplar which gives the layout a very professional look. Aero-influenced framing and styrofoam land forms keep the modules light and easy to handle. All are supported on well-engineered sets of interlocking legs, which set the rail height at 53-inches for the show. The mainline is laid with code 83 rail, with code 70 used for the sidings. The turnouts were all constructed using Fast Track components and jigs. The twin loop yards at each end of the railroad feature #12 turnouts with each of the five yard tracks capable of holding a 28 car train plus motive power. Mainline curves are a generous 50- and 52-inch radius and include transitions and super elevations. A Chicago Great Western local freight passes the refinery at Romeoville. 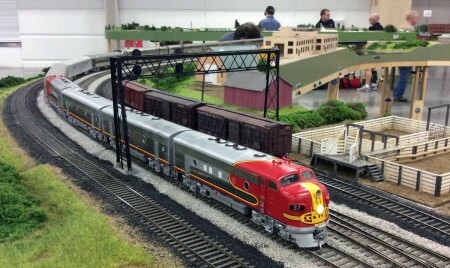 The train is by Dennis Stanczak, while Al Behland built the refinery. Photo by Bob Kosic. A Digitrax DCC system with two-way radio throttles provides the layout control. The layout’s fully operational, bi-directional, ABS searchlight signal system drew many admirers. All of the railroad’s highway grade crossings feature warning flashers and operating gates. The signal control systems, which worked perfectly during the entire show, utilize Chubb DCC detectors for train detection and Arduino Mega micro-controllers with custom software at each of the layouts control points. All in all, the Mod-U-Trak module specifications were well-designed and beautifully executed. The Milwaukee Road’s Morning Hiawatha crosses the Des Plaines River bridge. 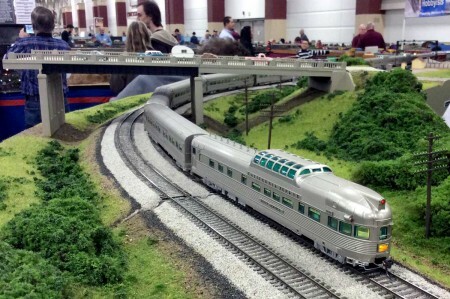 The train is by Matt and Bob Kosic. Photo by Bob Kosic. 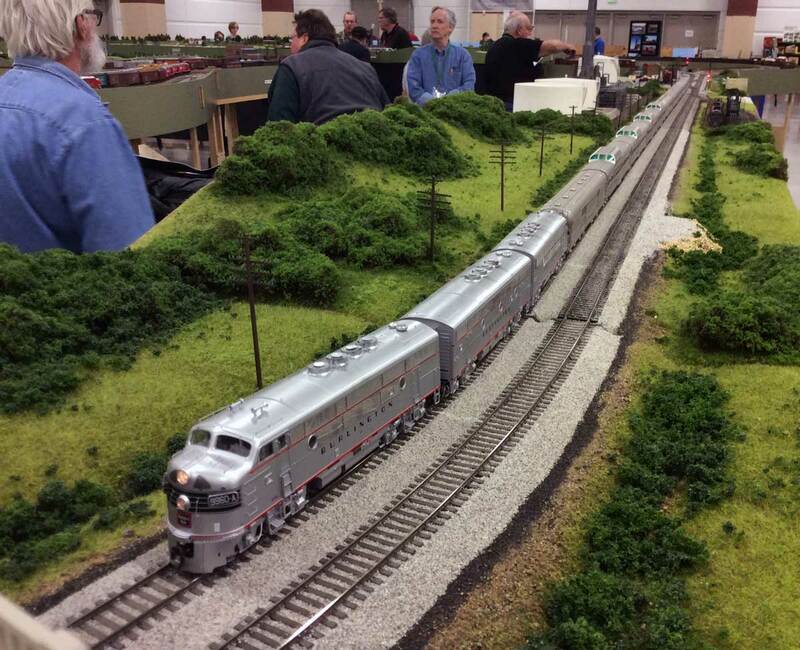 Train Fest 2015 was a joy to attend and seemed like quite a success. Thanks to Peter for his Train Fest report and to Bob Kosic for the Mod-U-Trak layout photos! Questions and comments can be posted below. Please follow the instructions so your comment can be posted. All comments are reviewed and approved before they appear. What material did the Mod-U-Trak use for the grass on their layout, and what is the color? Static grasses were used throughout the layout. The standard mix is a combination of various grasses. The predominate color is Heki Forest Green, although the mix also includes Heki’s Grass Green, Meadow grass and Noch Meadow Green grasses. A pinch and a dash of late summer and burnt grasses mute the brightness of the grass mix. Add more browns and yellows for late season grasses. The standard mix is also a combination of 2mm to 10mm thread sizes with 6mm being the most widely used.